On the Menu: Carb Addiction | This is an adventure. Sunday: Stuffed Jumbo Pasta Shells. Oh my goodness, I adore this recipe. I found it on Pinterest last year but it actually comes from a lovely food blog that I used to read many years ago – 101 Cookbooks. Beautiful photography, good food, vegetarian dishes, what’s not to like? (Note to self: Must start checking this site more often! Just looking at her homepage is making my mouth water.) Those shells though. Yes, this takes longer to make than most meals – maybe I need more practice stuffing shells – but the payoff is ommmm nom nom nom. I’m skipping daytime cooking knowing that I’ll be putting in more effort for dinner, and I’m going to be working outside this afternoon doing some spring cleaning in the backyard, mostly getting ready for Super Garden 2015!!! 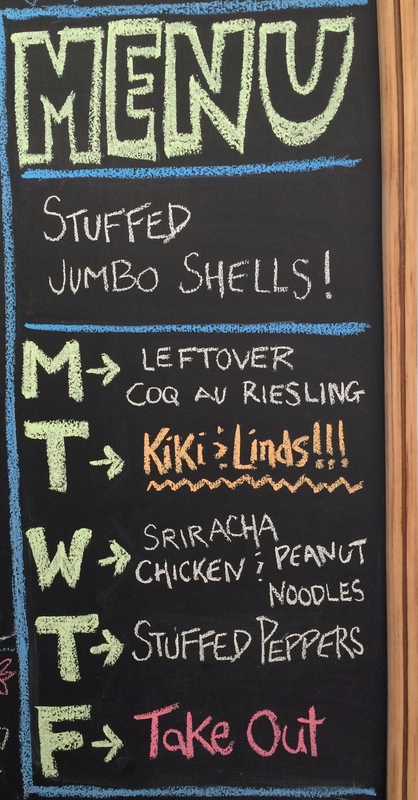 Monday: Leftover Coq au Riesling from Saturday night’s dinner…perfect with a side of pasta or rice. This gourmet dish was tagged as a must try weekend meal and I’m so glad I finally tried it out. Chicken in a creamy wine sauce served on top of pasta, yes please! My man especially liked the bacon bits in the sauce while I was partial to the mushrooms. Yumm. Tuesday: Dinner with Friends! My man is on his own and will most likely feast on leftovers (or his idea of Mac N’ Cheese – Kraft Dinner). Wednesday: Honey Sriracha Lime Chicken and Soy Peanut Noodles. I haven’t made this meal in a long time but I love it. We fry the chicken on the stovetop instead of BBQ skewers and it comes out just as good. The peanut noodles are just delightful, easy to throw together while the chicken cooks, and (if we can restrain ourselves) make for excellent leftover lunch. Thursday: Stuffed Peppers with Salad…meat-rice in a vegetable vessel, delicious. The only thing that could make this meal better would be if the vessel were plucked from my backyard, but we’ve still got a couple months to go before the garden is in full swing. Friday: Take Out. I think at this point it’s safe to say that Friday is always take out night. And…maybe it will be a salad this week. Nah, who am I kidding – carbs will undoubtedly be involved. May 3, 2015 - 6:11 pm Pingback: On the Menu: Free Format | This is an adventure. Enter your email address to follow the adventure and receive emails each time a new post is added.